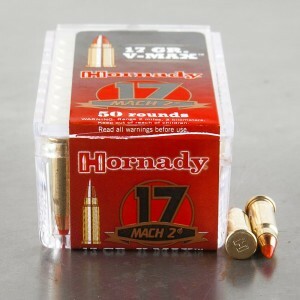 17 Hornady Mach 2 ammo, or 17 HM2 ammo, is a rimfire round based on several different calibers. Introduced in 2004 after the initial success of the 17 HMR, Hornady decided to design a lighter, and fast round. The 17 Mach 2 uses the 22 LR “stinger” case as a parent case, necked down a bit for the 17 caliber round. 17 Mach 2 ammunition is an incredibly fast round, capable of achieving more than 2,000 feet per second. This is nearly double the velocity of a 22 long rifle round. The way the 17 HM2 achieves this velocity is by using an incredibly lightweight bullet. The weight is a mere 17 grains, loaded with a V-MAX bullet. An advantage the 17 HM2 offers over the 22 is its use of the V-MAX bullet. These bullets resemble a more traditional spitzer round, whereas the 22 caliber is closer to a pistol round.